Howard Behrens (1933-2014) untitled 34 x 48″ plus frame, oil on canvas p.o.r. Washington metropolitan area acclaimed artist HOWARD C. BEHRENS died on April 14, 2014, from Parkinson’s disease complications. He was 80 years old. 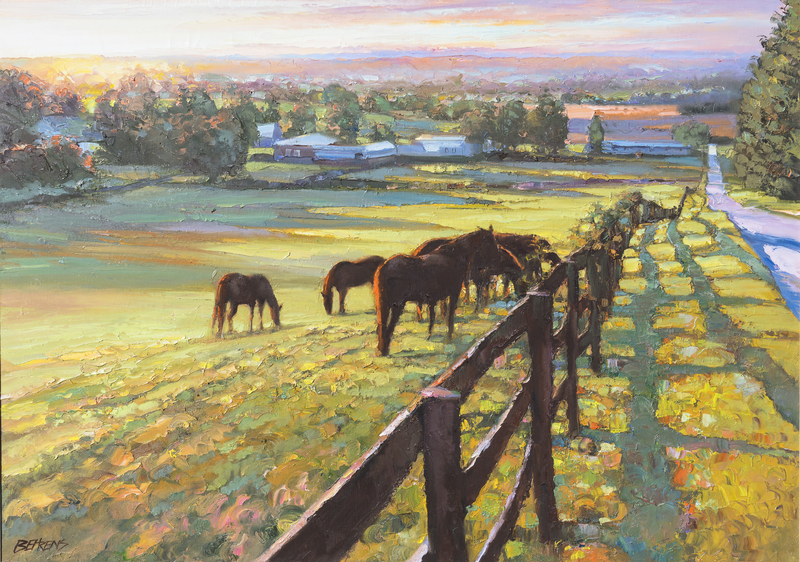 Mr. Behrens is regarded as the premier American palette knife artist of his time, with numerous shows in the United States and around the world. His work is found in museums and private collections worldwide. Howard Chesner Behrens was born on August 20, 1933 in Chicago, Illinois. His family moved to Takoma Park in 1940. As a young man, Howard’s artistic and creative talents emerged as he developed an interest in oil painting. He earned a Masters Degree in Fine Arts from the University of Maryland in 1964. Soon after graduate school, Behrens was hired by the U.S. Government Printing Office in Washington, DC, where his father was employed as a printer. For the next seventeen years he worked on a wide variety of publications that the Printing Office designed, illustrated, and printed for various agencies of the federal government. His passion for travel, for trying new techniques, and his endless hours of painting after work helped him to create his own style of painting with a palette knife. Mr. Behrens first solo exhibition occurred in 1981 with the Wally Findlay Galleries in Palm Beach Florida. This launched his career and was followed by hundreds of one-artist shows in the US and around the world. Through his art, he celebrated the beauty in living by painting some of the most picturesque spots on earth. Behrens considered himself to be more of an expressionist artist than an impressionist. Monet and Cezanne, who were impressionists, influenced his work. However, he wanted to communicate the act of painting to the viewer, which is why he regarded himself as an expressionist. The use of the palette knife enabled Mr. Behrens to add layers of depth, texture, and bright colors, which became his trademark as a successful artist. As opposed to the traditional paint brush, the metal edges of the knife enabled the immediacy of conveying paint to the canvas, and therefore engaged the viewer in the act of painting. Mr. Behrens is survived by his four children: Jesse, Jamie, and Scott Behrens, and Candice Behrens Grow, as well as his three grandchildren, Ella Lynn and Varley Steele Behrens, and Lia Marie Grow. Services are private. Instead of flowers, the family requests that those so inclined would consider making a small donation to the National Parkinson’s Foundation, Gift Processing Center, PO Box 5018, Hagerstown, Maryland 21741.